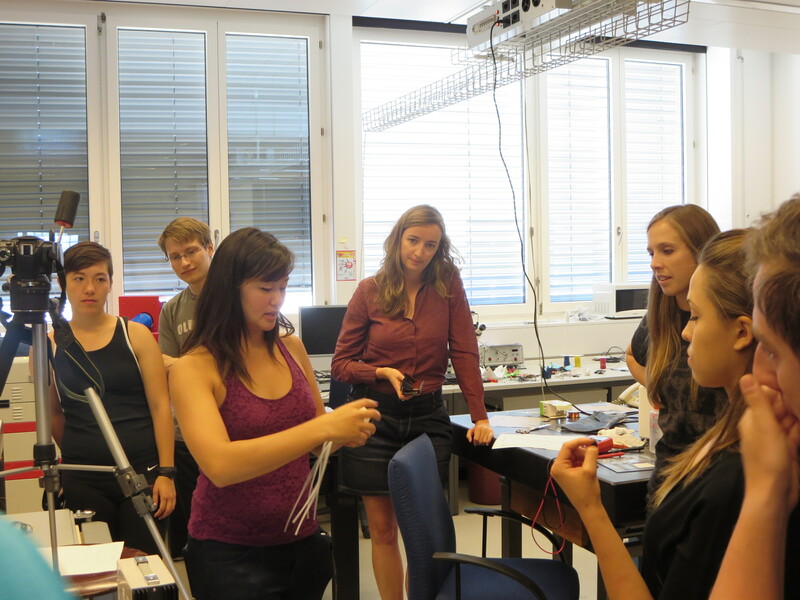 The EPFL research internship places students in a unique setting, where the departments are extraordinarily interdisciplinary. 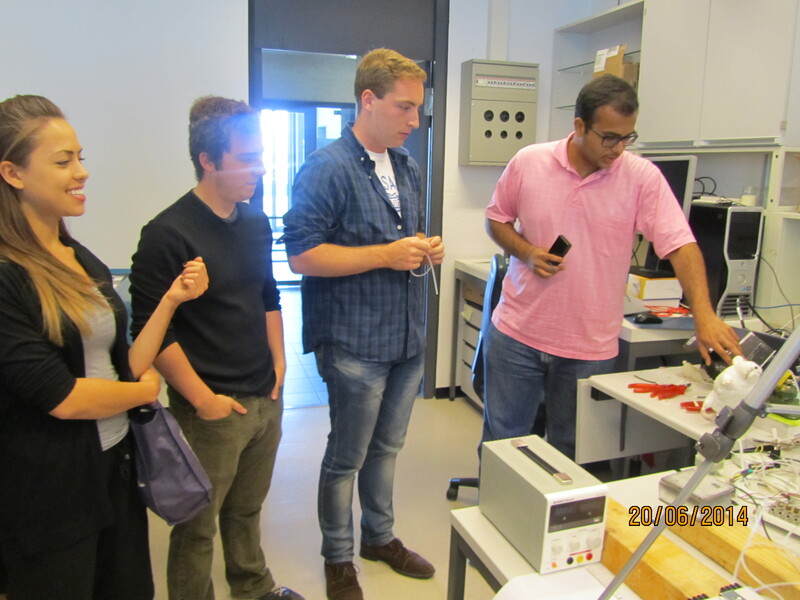 When I first arrived, I began touring labs on my own, eager to find out more about ongoing work at EPFL. However, after conversations with other students, I realized that they too were interested in pushing the boundaries of their current knowledge. This curiosity is a characteristic of the group that I deeply respect, and in retrospect it could almost be predicted from people who are willing to uproot and relocate overseas for an entire summer. From these experiences, I proposed a series of lab tours. 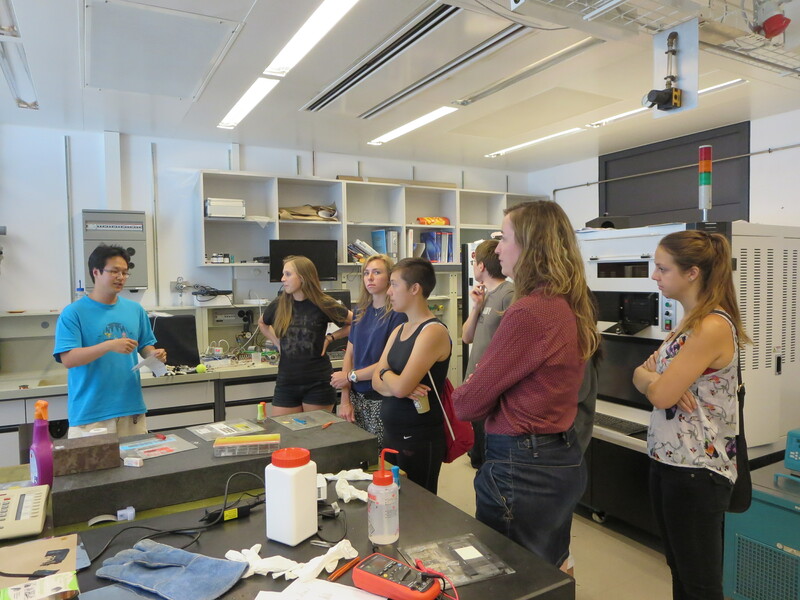 Each week, a student leads his/her peers through an overview of ongoing work, giving the rest of us a chance to see what is going on outside the walls of our own labs. I am happy that people were receptive to these tours, because it exposes everyone to new information, inspiration, and ideas. On the flip side, it’s also a fantastic opportunity for the presenters to further develop their speaking skills and obtain a holistic picture of their lab. For me, it’s wonderful to see how diverse my cohort’s interests are, and to be able to learn about topics that I otherwise would not have a connection to. Jessica, describing how pneumatic actuators behave. Manan, explaining his work on the rat exoskeleton. Ben, presenting an overview of the lab. This entry was posted in Non classé on 29 June 2014 by benshih. 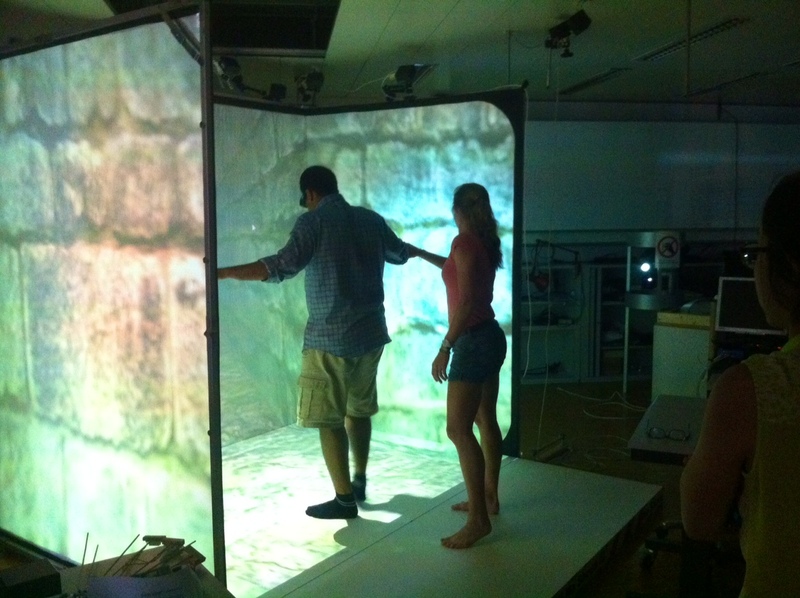 The CAVE 3D video game! After searching and taste-testing dozens of the Swiss chocolates, I have finally found the one. It’s Frey’s Supreme Vanille Bourbon (dark chocolate) found exclusively at the Migros grocery store, one of which is conveniently located underneath my EPFL flat. I must say the journey to this chocolate was not an easy one. It included scenic weekend trips on the GoldenPass Train to Gruyères, a chocolate tasting room, castle hikes in Ticino, a visit to the reflective lakes at Zermatt, and picnics by Lake Geneva. If it wasn’t for the help of my roommates that attend EPFL as students I would probably still be searching. 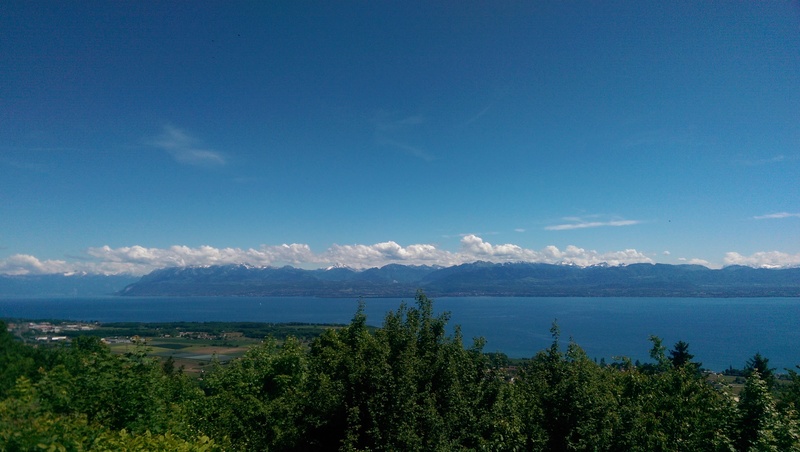 For a less dramatic taste, but equally engaging piece of Switzerland, I’ll share a little about my EPFL Internship program experience. I’ve learned more here in my month and a half so far than I learn in months of classes. There’s the additional benefit of flexible scheduling and getting to visit the gorgeous Swiss country with a group of new friends from the program. My favorite experience so far would be travelling with Ben and Kate to Ticino (the Italian region). We discussed a range of topics (including chocolate), hiked (a lot), and ate delicious Italian food. 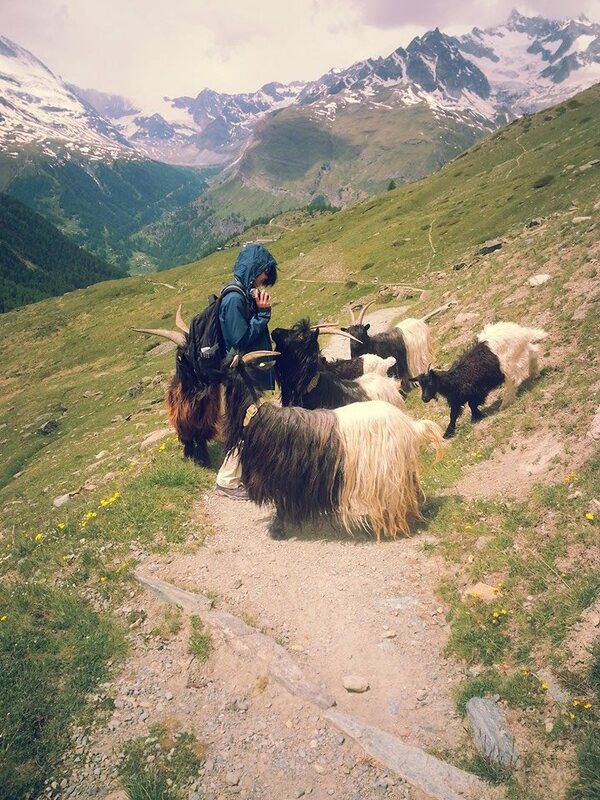 This chance to work in Switzerland is unique and made for the adventurous, bold, and academic student. This entry was posted in Non classé, Science and Research at EPFL, Visiting Switzerland on 27 June 2014 by morganjack13. Like many in this program, I work in a specialized lab working on a specialized topic that even I knew nothing about before starting this internship (to say nothing of my fellow interns). Having been asked to explain the topic multiple times, I wrote a relatively short and understandable blog post on the topic, which I will only link to rather than copying the whole thing here. The work is about as research-y as it gets, dealing with exciting new ideas that are far from practical application but high in potential. It is also very different from my past work in robotics, which has made the internship so both more challenging and fulfilling. Infromal talks with Ben was seemingly what led to the idea of a public tour of his lab past Friday, and I look forward to any more such tours or talks about the work of other interns here. 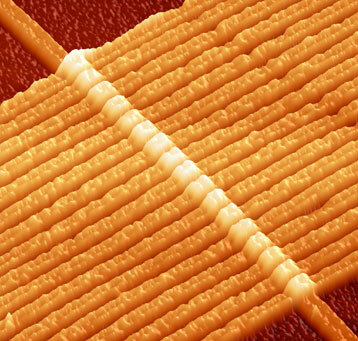 One of the benefits of a program such as this is gaining exposure to such new concepts as the memristor, and I hope to be exposed to even more novel concepts completely outside my expertise in the next few months. This entry was posted in Non classé and tagged Research, work on 24 June 2014 by thatandreyguy. Besides EPFL, I think the thing that I love most about Lausanne is Lac Léman. My favorite part of the day is going home on the metro and looking out over the buildings to see the snow-covered Alps jutting out of its freakishly blue water. To me, the best thing about this city is that it’s seemed to find harmony between its size and the presence of nature. A mountain hike, a jog by the lakeside, or a sailing excursion are all readily accessible, which I think explains why I see so many active people here. I haven’t been around in the winter yet, but I’m not surprised when people tell me that skiing becomes very popular during that time of year. All in all, being at the EPFL for me has been great so far, because I can do research at a demanding level and still stay interested in my surroundings. I think another contributing factor to this is how well-developed the public transportation is here. Getting places is not nearly the chore that it is in my old town of Pittsburgh, since a decent number of buses and trains actually exist in this city (and, in typical Swiss fashion, they are wonderfully on-time). I hope in the future I will be able to come back here as a Masters student; I am incredibly thankful for taking part in this program, because it’s shown me how much the university and its surroundings have to offer. This entry was posted in Non classé on 24 June 2014 by jkbiggs. Meet all our awesome Research Interns here at EPFL undertaking their internship for 3, 4 or 6 months and learn about where they come from, about their busy off campus agenda whilst visiting Lausanne, Switzerland and the rest of Europe, as well as some times about their research topics.